The final day of ISTE was full of relief and a sadness. I felt relieved that my brain would finally get a break. I would have time to look over and research all the ideas and tech I had experienced during this conference. I bit sad because I was going to miss this. I was going to miss being around all these educators, tech gurus and how much passion was in this building. I also felt like I was going to miss out on something. There was so much to see and do at this conference. I wanted more time to do all these things, but all great things must come to an end. With a full backpack and my bags packed I was ready to take on my last day and make it better than ever. 1st Stop on the Last Day! I walked up the stairs with conviction and excitement ready to take on the day. We made it to the Expo by 9:00 and got coffee. We walked around and saw some of the booths we missed the day before and some new ones. We stumbled upon Renaissance which is the creator of Accelerated Reader. I loved their interactive booth! People were able to write their favorite children's book on a spine of a book. This books were on a "bookshelf" and posted on the board. Which one is my favorite? Write your guess in the comments! After writing ours on the board we headed to a session at View Sonic. I had been following the ISTE Ladies Road Trip and was eager to hear them speak. Alice Keeler, Lisa Dabbs, and Christine Pinto all stood up and talked about the importance of the 4 C’s. 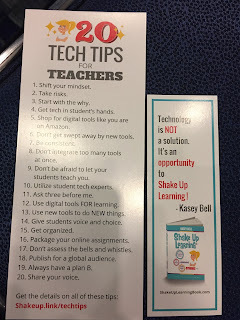 In full disclosure, I had never heard of or thought about the 4 C’s before this ISTE conference. I realized I put these in place in my classroom. Though, I had no concept of their importance and value in Tech until this conference. It was great to hear these three ladies talk! They discussed the amazing value of critical thinking, communication, collaboration, and creativity in the classroom. It was also great to see them in person. I had followed Lisa for a while and talked to her on Voxer. Alice and Christine were talked about (by fellow teachers) so much during ISTE that it was great to put a face to a name. They gave me hope and strengthened my conviction to do amazing things moving forward. After this, I tried to get into a session but I got there too late. So I decided to go back to walking about and checking out the Expo. This is where I stayed for rest of the day until my BOYDex session. I enjoyed wandering and talking to different people. It’s funny how no matter how many times you wander through the expo you always see something new. I even won a hat and a bookmark! I also found the later it got the more booths started giving away things, which is something I am all about! I don’t care if its a sticker I am all about free stuff. Time dwindled closer to the BYODex session so I headed that way. I was excited to learn about resources that were considered an ELL Superpower Toolkit. After waiting both in the hall and in the room for a total of 25 minutes we found out the speaker was not present...bummer. So on our way out, I stopped one more time by the ball pit in despair...it was gone. It felt like as quick as this experience had started it was ending as quick. Saddened, I stopped by the Microsoft Vending Machine. All you had to do was tweet with the hashtag and out came a prize pack. We can all say that’s awesome! I have never seen something like that and to be honest I’m all about Twitter Experiences. We traveled for the last time to the Expo. We wandered through picking up freebies and crossing our fingers. With 2p.m. on the horizon, we were hoping one of us would be chosen in the raffles held across the expo. As 2p.m. came and went we were disappointed with no wins. I guess Hannah won big with the Hamilton Tickets so we were done winning for this trip, lol. I don’t want to end this all on a sad note though. As sad as it was to leave, and trust me I was sad to leave, I had such a great experience. I have so many ideas! I learned about so many products, met so many great people (including some rock stars of education), and I overcame my anxiety to make this all happen. This was a great conference and I highly recommend it to anyone who hasn’t gone before. I am doubtful I will end up in Philadelphia next year. If it ever comes back to Chicago ( I hope it does) then I will be there! I am so thankful to all those who spent their time to share their knowledge. I am so thankful to my colleagues for going on this awesome adventure with me. When we submitted our names for PD Scholarships we never thought we would get the chance to go and have such a great time. What is something you learned this summer? What PD would/ is #OneInAMillion to you? Share and stay current with my Facebook Group and Page! Great reflections Megan, I remember by first ISTE, there was so much to take in and I was so excited for the week to arrive and it flew by! I agree there is definitely sadness as it comes to an end, especially when you have the chance to be in the same place as friends from all over the world! As big as ISTE is, I am always amazed at how often I run into the same people, and then there are times where I can't seem to connect. See you next year in Philly!